DIY hedgehog house. Give your prickly garden visitor a helping hand by creating this sturdy des-res. It will make a cosy Winter hibernation home or a snug Summer nest. The great news is that hedgehogs do definitely use artificial hedgehog houses – read more about that here. This design was made by my husband Joe. Every hedgehog rescuer needs a DIY expert to support them. There is always something that needs building or mending in the hedgehog hospital! Every rehabilitated hedgehog that is released from my rescue is provided with one of these houses to help them settle into their new home. Some will remain living in them but others will continue their search for the perfect ‘natural’ residence – they can be fussy creatures! You can always use it as a feeding station if no-one makes it their permanent home…. The entrance tunnel helps to keep out predators as well as wind and rain. A DIY guru who can translate the diagram into reality – ESSENTIAL! Once you’ve built the house, don’t treat the wood with anything nasty like creosote – these can be toxic to hedgehogs. You can paint the exterior with fence paint to prolong its life. Drill some ventilation holes towards the top of the side walls. Fill the house with some hay as a ‘new home’ gift for your spiky visitor. You can also place some piles of hay around your garden underneath something to keep it dry and then they can add more to their nest whenever they like. Follow these tips to site your hedgehog house and increase your chances of a prickly resident. Face the entrance away from the prevailing weather. Place it in a quiet area that is unlikely to be disturbed. Insulate the house and provide extra protection from the weather by covering it with branches/twigs/leaves. Don’t treat the wood with strong chemicals like creosote. Clean it out in Spring after the hibernation period and before nesting begins (late April). Don’t line it with newspaper as this tends to go soggy. You can also watch my video on where to place the hedgehog box. This will give you the best chance of attracting a resident. Research indicates that how the box is sited is very important. UPDATE Spring 2018. I would recommend going ahead with the felt roof covering or placing a sheet of plastic over the house before covering it with natural materials. I have found that the recent very wet weather has managed to penetrate the hedgehog boxes made without these precautions…. Good luck and please share your photos when you’ve completed your project. I run a hedgehog rescue in York. My work is entirely self funded. If you have found my advice helpful, you can make a donation here. 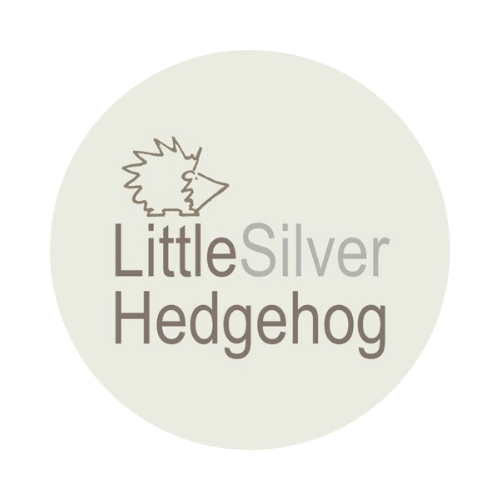 I also make handmade silver jewellery inspired by nature and wildlife to support my work – please check out my online shop at www.littlesilverhedgehog.etsy.com. Previous postHibernating hedgehog – dead or alive? Next postWANTED – homes for hedgehogs! I love your blog, really interesting posts and lots of great ideas! Thank you so much for following, always great to get feedback! re.your build a box,on your plan the lid fits down the sides of the box,on photo it don’t, if you run a hose on top of box the water will follow felt around and seep through gap between roof and wall of box,and may i thank you for building box and caring for our little friends.ken west midlands.